Cirrus Vodka’s new distillery has the capacity to produce 100,000 cases per year. 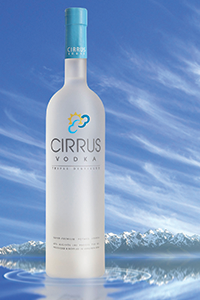 After shutting down in 2013, Richmond-based Cirrus Vodka is back. “It’s a much bigger mousetrap, but it’s the same product, which I think is the best vodka in the world,” says Sterling Roberts, who reopened Cirrus along with a friend, Gary McDowell, and Paul McCann, the company’s founder and master distiller. McCann started Cirrus Vodka in 2004. Two years later, the potato-based vodka company won a gold medal at the San Francisco World Spirits Competition, and McCann left his career as a policy analyst to focus on Cirrus full time. By 2013, McCann had set up Cirrus’ distillery on Hardy Street, but that property and its equipment was foreclosed that year, so Cirrus stopped production. That’s when Roberts and McDowell, self-proclaimed Cirrus Vodka fans, stepped in. They weren’t able to stop the foreclosure but set up a bigger operation at nearby Ownby Lane, which opened last year. The new distillery has the capacity to produce 100,000 cases per year, and Cirrus hopes to eventually distribute in all 50 states. The product now is sold in Washington, D.C., and Virginia, where it is available at more than 100 ABC stores. The goal, Roberts says, is to ramp up production to 15,000 cases by July. A big part of taking the company to the next level is marketing, including introducing Cirrus in states that may not be as familiar with the product. The Vodka costs $27.99 for a 750-milliliter bottle and $49.99 for the 1.75-liter bottle. It also helps that McCann is not running the show by himself. “He was spread way too thin,” says McDowell, adding that McCann was previously producing, bottling and marketing the vodka without any help. How does McCann feel about producing vodka again?